Mysterious ruptures are appearing in the ozone layer, allowing the searing rays of the sun to sterilize the earth below. New nuclear missile sites are being activated in the Soviet Union, controlled by a shadowy figure of the old regime. Which will destroy the U.S. first: unfiltered ultraviolet rays or unfettered realpolitik? Remo is sent in search of the machine that seems to be causing the atmospheric chaos, but a gorgeous redheaded scientist is intent on leading him astray. 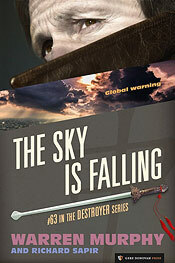 Can the Destroyer save the ozone before the icecaps are melted and the ICBMs go ballistic? And where on earth has the legendary treasure of Sinanju gone?